Adam Gorlitsky is walking three to four times a week. A miracle, considering he's paralyzed from the naval down. Adam lives in Charleston, South Carolina and is a member of an SCI community at the hospital near where he lives. At a routine visit to the hospital in August of 2015, it was mentioned that he would be a great candidate for a revolutionary product that would enable him to temporarily walk again. He enthusiastically agreed to try it. Eight months later, he went back to the hospital and stood up for the first time in almost 11 years using a product known as a ReWalk Exoskeleton. It was the 10th anniversary of his accident and a monumental day for Adam's future. "It was an incredible feeling. I felt like nothing was holding me back anymore," Adam said. "December 30 was the day I lost my legs, and also when I got them back." Adam initially started fundraising to purchase his exoskeleton through GoFundMe in September of 2015. At the same time, he began selling 'I Got Legs' t-shirts to supplement the donations. The shirts became so popular, many celebrities were seen with them, including Stephen Colbert, Sean Austin, and Anthony Mackie. "I tell people that when I'm in my robotic exoskeleton, I don't feel disabled anymore, nor do I feel able-bodied. I feel re-enabled...it's like a sense of freedom, really," he said. Adam was 19 years old when a car accident rendered him paralyzed. "The moment you become disabled, you are kind of forced to be mindful of all the surroundings that you weren't forced to be mindful of before. So if there's no ramp to a restaurant, how do you get around that? If you want to get on the beach, how do you do that?" Learning how to be independent while also occasionally relying on others was a challenge for Adam. When the Re-Walk Exoskeleton became a part of his life, Adam knew he wanted to use it to give back to others. He looked at his boxes of t-shirts that helped him get to this point in his life and knew it was time to start on the next big project. "I always knew I wanted to do a non-profit organization, but at the time [of my accident] I was just so young and I didn't know what it meant to run a business, really. I didn't even really know what it meant to be disabled yet." On April 2, 2016, he became the first paralyzed man to complete the 10k Cooper River Bride Run, which effectively launched his ReEnabled Race Tour. That same month, I Got Legs became an official non-profit with the mission of bridging the gap between what it means to be disabled and able-bodied. Now Adam has a goal of walking one million steps and raising one million dollars for people with disabilities. Adam is working with races all over the country to add an I Got Legs! ReEnabled Racing category for what he calls "re-enabled and other challenged athletes," ranging from paraplegics like himself to other challenged athletes, like one man who went through a triple bypass surgery and signed up for a race on the re-enabled race tour. Adam has even bigger plans for the future of his races, now that he is the owner of a new BraunAbility MXV. For 11 years after the accident, Adam would break down his wheelchair and put it in his Toyota FJ Cruiser anywhere he needed to go, sometimes up to 12 times in a day. "I'd come home from my parents' house and I'd be like 'Aw, man, I don't even want to get out of my car and put my chair together again,' you know?" Depleting his energy day after day was starting to tax Adam, especially as his race plans began taking off. He visited Ilderton Conversion Company in his hometown to see how they could help. Immediately, they showed him an MXV, an accessible vehicle built on the Ford Explorer by BraunAbility. With the help from BraunAbility Finance, Adam secured a low-interest rate and outfitted the MXV with hand controls so he could drive. "Right when I first got it, I was like 'Man, that is an incredible car,'" he remembers. The MXV was wrapped in I Got Legs artwork and became like a traveling billboard, an office for Adam, as well as a rolling boutique when he pulls a trailer to carry extra merchandise. 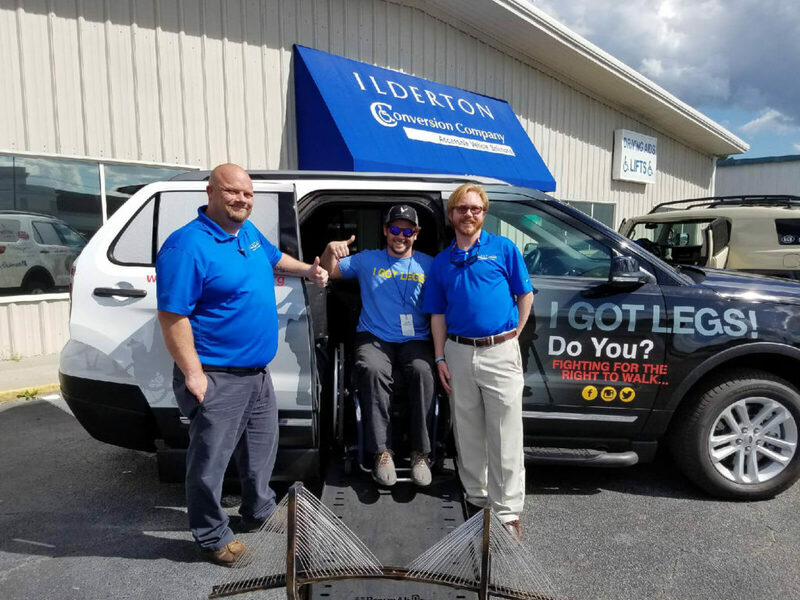 It was a truly radical purchase for Adam that wouldn't have been possible without the great mobility consultants at Ilderton and the ideal rate and terms through BraunAbility Finance. Adam's next ReEnabled race is July 4 in Charleston, South Carolina. Keep track of his one million step progress by visiting his site here.